Hand-crafted, highest quality, bespoke oak trusses built to order and supplied in kit form for easy assembly on site. The walls shown here are for illustrative purposes only. On computers and web browsers that support it, there's usually a 3D spinning version of a truss here that you can edit with the controls below. We're sorry but it doesn't look like your computer or device can run our interactive 3D truss builder. It will run on most modern computers with an up-to-date web browser. We're sure you'll love our truss builder so please try on another computer if possible, else please feel free to email your requirements or drawings to enquiries@iwood.co.uk. You can still put your requirements into the controls below and get a price if you know what you need. Please note that due to the natural drying process of air dried oak, the beams will have surface checking and splits. We recommend that the height of the tie beam is always equal to or greater than the width in order to make the truss as strong as possible. We recommend that the height of the rafters are always equal to or greater than their width in order to make the truss as strong as possible. We recommend that the height of the braces are always equal to or greater than their width in order to make the truss as strong as possible. This truss above matches a design that has already been approved by a structural engineer, or you will get it approved yourself (we can put you in touch with a structural engineer if required). Please note we will require a copy of the structural report before we can begin manufacture. Contact us directly for quotes on different designs. 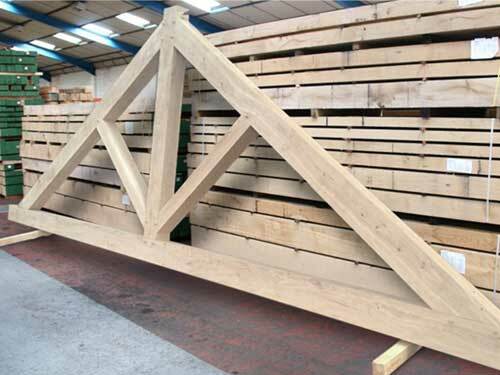 iWood is proud to supply high quality, made to measure oak trusses. Use our Oak Truss Designer above or send us your existing drawings for a quote. We are currently working on an approximate lead time of 6 - 8 weeks. Oak has been used for centuries in the grandest buildings because of its strength and beauty. iWood's trusses are each hand made using traditional techniques. They're made with planed European Oak with mortise and tenon joints predrilled to take supplied Oak dowels. 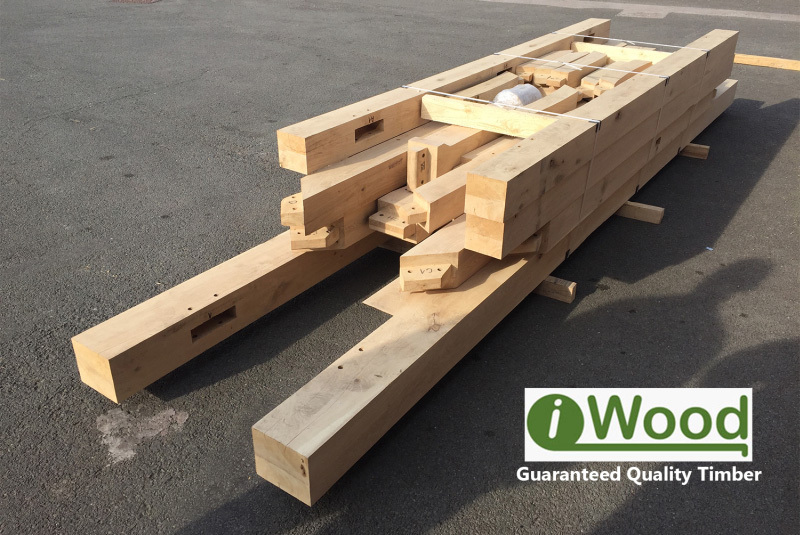 iWood supplies trusses direct to end clients and to builders and joinery companies who find making trusses from scratch very time consuming. You can be confident in the quality of our trusses. Our oak trusses are supplied ready to assemble and simply require slotting together and the dowels inserting on site. Get a price above or call us on 01889 279 018 to discuss your requirements.